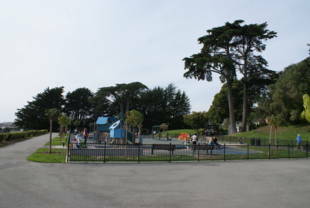 Alta Plaza Park features a playground and a large lawn area, two full tennis courts plus a multipurpose basketball/tennis court.There are plenty of paved walking trails, benches, and views of the City. There is a kids' lot that contains three different play structures, a sand lot, benches, slides and seven swings.The off-leash dog area is on the east side of the park. Wheelchair access is at Scott and Jackson Streets.Alta Plaza Park is owned by the San Francisco Recreation and Parks Department. It was alta but it was no plaza when the City purchased the 11.9 acre square in 1877. The site was a rock quarry with green grass covering its gouged hillsides. 'Chances for Picturesque Landscaping as Yet Neglected'-City Reserves Are Public Parks Only in Theory' railed the press in 1888.' 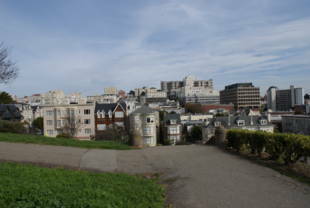 Citing a 'dollar limit ban,' the article said 'Alta Plaza lies high, affording magnificent views of the city and bay, while the rough and hilly nature of the tract would afford the landscape gardener an unexcelled opportunity for the display of his skill. Absolutely nothing has thus far been done, however.' Twenty years later, Superintendent of Parks John McLaren came to its rescue, filling the hollows, topping them with soil, and planting lawns which he somewhat reluctantly fashioned into terraces. 'Slopes and terraces as a general rule should not be introduced into park scenery except to overcome an insurmountable difficulty,' he wrote in a 1910 park report, adding, 'Here the excessive steepness of the slopes prevented any other method of improvement.' Succeeding generations of park lovers, walking up the staircases that connect his U-shaped terraces and pausing to marvel at the views, have rejoiced at the 'method of improvement' McLaren allowed himself to use. Source: Various publications, San Francisco Library History Center. Bounded by Scott, Clay, Jackson and Steiner Streets, the park is blessed with breathtaking views and bordered by vigilant, protective residents. 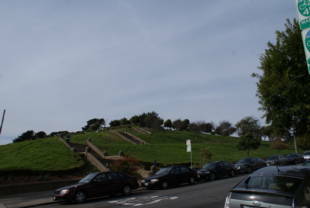 In 1938, with help from the city attorney, Alta Plaza neighbors were able to block tentative plans to sell the park and use the money for other recreational projects. And then there was the famous 'stairway incident' in 1971. During the filming of Warner Brothers' 'What's Up, Doc?,' the script called for a Volkswagon and five sedans to come barreling down the grand staircase at Clay and Pierce. The speeding cars chipped off chunks of concrete as they went. Outraged neighbors extracted a pledge from the Recreation and Park Department that repairs would not, like other stairway repairs, appear as white patches, but match the original orange color. Fast forward to the present and the couples with young children who use the park's playground as their yard. 'I got a lot of great ideas in the Luxembourg Gardens in Paris,' says Lauren Hall, who is heading the newly-active Friends of Alta Plaza Park. Visits to those gardens, with sons James, 2 and Sumner, 6, fueled her desire for major improvements to their facility back at home. Although it was renovated 14 years ago, lack of upkeep and repair, combined with removal of the storm - damaged pine trees, have taken such a toll that today the playground bears little resemblance to its look in 1988. At the advice of Lynne Newhouse Segal, one of seven Recreation and Park Commissioners ('the most helpful person on earth'), Lauren met with neighbors Mark Buell, Neighborhood Parks Council and Rebecca Green, of Friends of Rec and Park, three months ago. They organized a community meeting at Town School which generated wide neighborhood support and pledges of financial help, some of which were written on the spot and immediately bankable. 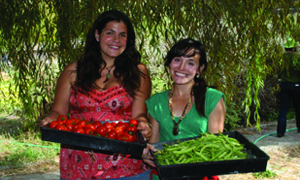 Other fundraising events - a cocktail party and tea for young parents - are being planned by the Friends' steering committee. A design for the new playground, Friends of Rec and Park's first priority is on the drawing board of landscape architect John Thomas at DPW, but other site projects are waiting their turn. 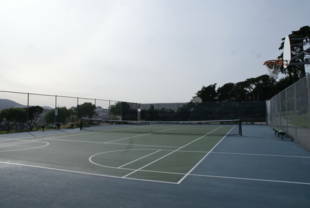 Among them: an improved dog walking area; resurfaced tennis courts; picnic tables; site improvements like flower gardens and a water fountain with dog drinking bowl. December 31st, 2002 is the target date for submission of playground construction budgets, to be structured in three levels - $350,000 for basic work; $500,00 and $750,000 for upgrades. Friends of Rec and Park is serving as the fiscal agent.